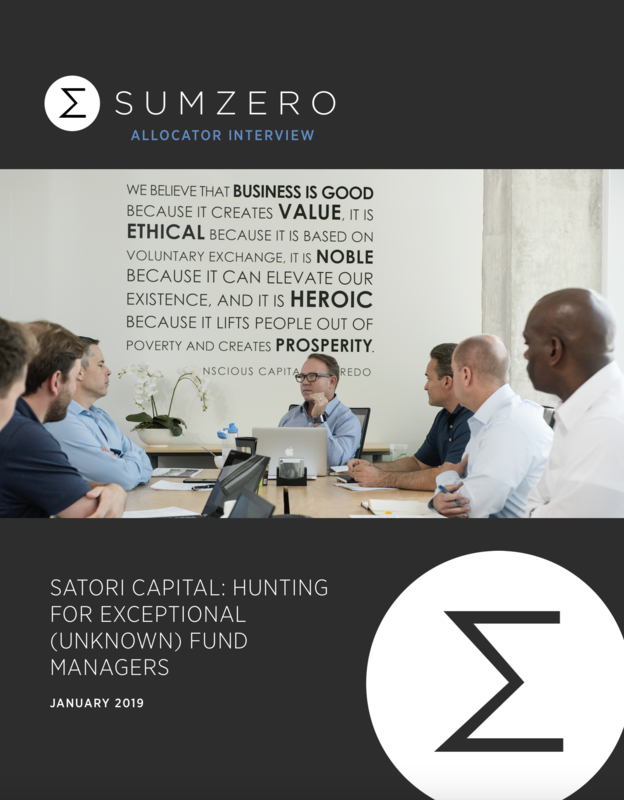 This is the third installment of the SumZero Allocator interviews, a series of discussions with respected leaders in the institutional investment space. My name is Nicholas Kapur and I am SumZero’s COO and head of the firm’s internal fund manager program called Cap Intro. Today I am honored to be joined by Mr. James Haddaway of the Dallas and Fort Worth, Texas-based investment manager Satori Capital. Haddaway helps oversee more than $1B in firm assets comprised of private equity, alternatives, and third-party investment managers, many of whom fall into the ‘small and emerging’ category. James Haddaway is chief investment officer and managing partner for Satori Alpha, Satori Capital’s alternatives investment platform with more than $650 million in assets under management, and for Satori XL, a program that provides acceleration capital to emerging investment managers. Prior to joining Satori, James was a partner and president at Corriente Advisors and worked as a corporate banker for both Frost Bank and Regions Financial. He received a B.A. from the University of Texas at Austin, and he lives in Fort Worth, Texas, with his wife, Shannon, and their three children. James Haddaway, Satori Capital: Well, first off, they’re not typically early-stage – they’re small. We actually like our emerging managers to have an established track record, but we’re fine with lower assets under management (AUM). So I wondered – can my colleagues and I do this in an advisory capacity for a select group of emerging funds – specifically, those with good track records led by quality people that just need help on the business side? NK: You mentioned that you like managers who are “great investors but inexperienced business people.” Why? All else equal, aren’t both skills necessary? JH: They are, but if a manager is really good at both, they don’t need us – they’ve likely already grown. The real opportunity for us is when we find a great investment manager who needs help on the business side, because in many cases, we can improve the business. Most hedge funds are not that complex, but there’s a big difference between investing and the business of investing – they’re unique skill sets. And we have several people on the Satori team who have done both, so we can provide significant insight to managers who don’t have the experience we have. We also have great resources on our team who provide help to our acceleration partners in areas like recruiting, investor communications, capital-raising, compliance, and more, so we can keep the managers focused on what they do best – investing. NK: Tell us about the firm’s selection process. You mentioned that you’re looking for the proverbial ‘needle in the haystack’ manager. How do you define that exactly? JH: I say needle in a haystack because although there are many sub-$25 million hedge fund managers out there, there are not many with five-plus-year track records. There are more than you would think, actually, but it’s not easy to run a business for several years on the income generated by such low AUM, so many small funds don’t survive long enough to establish the kind of track record we want to see. In fact, it’s a bit of a built-in filter for us. The ability to survive through years of not raising money despite great performance – that indicates to us that the manager has a true passion for investing, is able to live simply, and has the kind of grit we like to see. As for our selection process, we use both quantitative and qualitative analysis. On the quantitative side, we do a thorough dive on the data. If a manager has five or more years of track record, we can go as deep as looking at every single trade, trying to understand the context behind returns. Many managers look great at the surface on a quantitative basis, but when we dig in, we sometimes learn that there were very few investments that contributed to most of the alpha they created. Of course, we are going to look at all of the key performance ratios, perform factor analysis, conduct stress tests, etc., but our most important takeaway from quantitative diligence is whether a manager generates sustainable alpha. We are just as thorough on the qualitative side. For example, we evaluate for certain characteristics like open-mindedness combined with confidence – a paradox of sorts. We want managers who are decisive yet willing to change their minds if the facts change. We call it a “learner” versus “knower” mindset. NK: Some obvious exceptions notwithstanding, I tend to believe that the skills that make some people strong investors also make them pretty lousy marketers. For the most part, the two skill sets seem mutually incompatible. Your strategy suggests you agree with that, but the question is: Is a manager that knows how to brand/market him or herself dead-on-arrival for you? Is it a disqualifier by definition? JH: No, it’s great if we find someone who already knows how to do it – it’s just very rare. In our experience, they all need some coaching, and that’s part of what we provide – coaching on how to present their fund, their edge, their pitch. We often find managers who have a good natural ability to tell their own story, but they need some guidance on what’s important to a potential allocator. There’s often a tendency to overshare, for instance – they go too far into the weeds, and the prospective investor gets lost. So they need assistance on how to present information in a systematic way that promotes a clear understanding of how they generate alpha and think about risk management. We also emphasize helping them manage their time, so they’re not spreading themselves thin on marketing when we’d all be better served by keeping their focus on investing. But no, we would not disqualify someone because they’re a good marketer – that’s just not typically what we find in the sandbox we’re playing in. And it’s not really that we’re dealing with bad marketers – it’s often just individuals with very little experience. NK: During a recent call, you mentioned that your managers generally have a non-traditional background and are typically not in New York City. Why is this important to you? JH: We think a lot of capital in the seeding and acceleration space chases the really good pedigrees. If you’re an institutional allocator, and you’re looking at seeding or investing in an emerging manager, and you find someone who went to all the right schools, joined the right investment bank, and worked at the right hedge fund(s) – if that investment doesn’t work, you are likely not going to lose your job. There’s a perception of safety in pedigree. So that’s where the herd goes, and it’s just our natural inclination to go look in a different place. Our first acceleration investment, Crawford Lake, was with two guys with very non-traditional backgrounds. They went to rabbinical school, they were in Lakewood, New Jersey, of all places, they were more technical traders versus bottoms-up investors – they just did not have the traditional pedigree at all. But we thought they were amazing investors and risk managers, and they had an exceptional track record. They were at $12 million in AUM when we invested, and now they’re at $900 million, and they’ve built an institutional-quality business. So all stakeholders have done incredibly well on that one, and we never would have found them if we’d only been looking for the traditional background and only looking in New York. Similarly, we have more recent acceleration partnerships with Atlas out of Charlotte, North Carolina, and Pavise out of Mahwah, New Jersey. We think they’re great investors and risk managers – Atlas was actually up 9% in 2018 – and they don’t have the perfect Ivy League pedigrees, either. Just great people and fantastic long-term track records. NK: We chatted about Satori being willing to ‘take hair on the deal’ in terms of its managers. Can you give me an example where Satori was willing to invest in a manager that the broader industry was avoiding for whatever reason? JH: Our Crawford Lake investment is a perfect example. They were completely off the radar. Others in our industry definitely questioned our decision. But they had a seven-year track record that we thought was exceptional: Mid-teens net returns. Made money in ‘08. Made money in ‘11. Worst drawdown: 5.8 percent. Low volatility. Great risk managers, very disciplined. And when we looked at the stocks they were trading, we could see that they could scale. They just needed help. It was a no-brainer to us. NK: Your recent ‘CIO Perspective’ investor letter itemizes a number of key criteria that you look for in your managers, one of which is ‘Grit’. What does that word mean to you exactly, why does it matter, and how do you assess it? JH: We sometimes call it the “cockroach factor” – managers who aren’t going to be kept out of the investment business by small AUM, and who are naturally pretty tough. They were born to invest and can withstand a lot of hardship – and probably already have. We do have specific criteria we look for, and we have a list of behavioral descriptive indicator questions that are carefully crafted to draw out those attributes. We’ve invested a lot of time, money, and research figuring out what to ask and how to ask it – and our operations director, Hope Kahan, has become an invaluable in-house resource for this – so we can very methodically ascertain who has these characteristics. It’s kind of our secret sauce. NK: Apart from some of the stuff we have already discussed, what is an immediate disqualifier for Satori in terms of a prospective manager? JH: Obviously, the usual red flags apply. If you have things like compliance issues or bad references, that’s a disqualifier, of course. But in terms of characteristics, it’s arrogance. I’ve been in this business for a while, and I’ve made money and lost money, and let me tell you, when an investor thinks they’ve got it all figured out, I’m personally running away. Now, you have to have confidence, but not arrogance – that’s what makes this so tricky. The willingness to change one’s mind is the critical difference. NK: Let’s reverse that: What, to you, is a trait that offers the strongest indicator of long-term success in a manager? JH: I have to go back to the quantitative factor on this. It’s the data. Past performance does not guarantee future results – we all know that. But when we have five, six, seven years of data, we can really dig deep and find out, at least, how good a manager has been, and how they are improving over time. The other thing that’s very important to us is risk management. We’re looking for great risk managers who don’t like drawdowns, who are trying very hard to not lose money. A lot of our managers really care about the non-fundamental reasons why a security might move. So they consider the macro environment, they have tight risk controls, and they’re very disciplined. We put a lot of emphasis on that because we believe with our acceleration investments, if we do our due diligence right and find a great risk manager with the potential to grow significantly, we can potentially create a relatively low-risk investment with potentially very high upside. It is possible – difficult, but not impossible. It’s exactly what we did with Crawford Lake, and Atlas looks well on its way, too. NK: How does Satori go about prospecting for these off-the-grid, idiosyncratic investors. What fuels your supply chain? JH: We have a methodical system that centers on talking to third-party service providers. For example, every manager has to have a prime broker, so if anyone’s going to know what small funds are out there, it’s a prime broker. We have identified several who specialize in – or at least, aren’t afraid of – smaller managers, and they can give us great flow. We also attend quite a few of the emerging manager conferences and make contacts that way. So it’s a concerted outbound effort. One interesting thing we’re seeing now is that potential partners have started to hear about what we’re doing, especially in the demographic of long track record/low AUM, so our inbound flow is starting to pick up. NK: Lastly, what advice would you give to someone considering the launch of a new fund? What do you think is the most important thing these individuals can do to increase the chances of them being a viable target for Satori’s acceleration platform? JH: Get started. Over the years, we’ve had a lot of managers who’ve come to us saying, “If I can get $20 million, I’m going to launch.” And our answer to them is always the same: We’re not interested until you scrounge up some capital from friends and family and put your own money in and get it started. Because we want to see that the desire is there – that no matter what, they’re going to do it. If they need some critical mass to get started, they’ve essentially self-selected out of the pool we want to work with. Investment managers interested in learning more about Satori’s investment program should direct inquiries to James Gorski at gorski@satoricapital.com. Investors interested in learning more about opportunities to partner with Satori should direct inquiries to Nicole Lacues at nicole@satoricapital.com.